I make no apologies for getting the inspiration for this recipe from gourmet forager Robin Harford (see Eatweeds for more info). His enthusiasm for this very common spring ‘weed’ is echoed by Roger Phillips – so that alone should inspire you to have a try . . .
Simmer the hogweed shoots for a couple of minutes in boiling water, then strain and fry in the butter for five minutes until wilted. Pour in a little stock, cover and steam for about 15 minutes. Serve immediately with butter, black pepper and a slice of lemon. 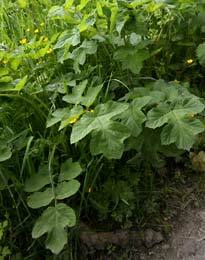 A couple of notes of warning – hogweed can (rarely) cause allergic reactions. It’s a member of the celery family, so if you have a problem with this, you might want to steer clear. Also there is a much less common namesake, giant hogweed, whose raw sap can cause serious blistering to susceptible individuals. The shoots coming up over the next month or two (until mid- to late May) will almost certainly be the delicious ‘normal’ variety.